I know, it’s been quiet here. There’s been a reason for that though, or more accurately two reasons. I’ve been working on a book writing project and I’ve been studying really hard to pass the MCSM – SharePoint exam. 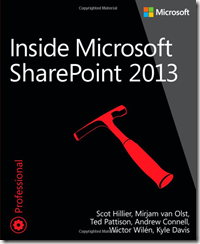 For almost a year I’ve been working on writing Inside Microsoft SharePoint 2013. Luckily I didn’t have to do it alone, because I can tell you, I would still be writing now. I had the privilege to be writing with a couple of really knowledgeable people and experienced writers. I have to say a special thanks to Scot Hillier and Ted Pattison for asking me to co-author the book, I was, and still am, honored! I really enjoyed the writing and would like to do more of it. I didn’t enjoy the deadlines as much though, so I’m not sure when I’ll attempt another writing project. The book is the SharePoint 2013 version of the well known “Inside Microsoft SharePoint” series and like its predecessors it’s targeted at both new and seasoned SharePoint developers. You can order the book from different web sites, like Amazon. As if the publishing of the book wasn’t enough to get me into a festive spirit, I also managed to pass my MCSM SharePoint exam. Even though the exams have been cancelled, people that had already taken the training, but not passed (all) the exams were allowed to (re)take the exam until the end of 2013. I wasn’t sure I wanted to invest the time needed to pass in a certification that didn’t really exist anymore, but after going back and forth for a month I decided that I wanted to prove to myself that I could do it by attempting to pass the last exam. I’m very happy to be able to say that just before Christmas I got the email announcing that I passed and that I can now officially call myself an MCSM SharePoint. Hopefully having finished these two rather big projects will mean that I get some time to post here very now and then again. Let’s call it my first new year’s resolution..